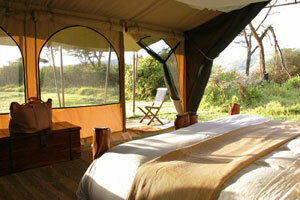 Saruni Samburu is a lodge located in Kalama Wildlife Conservancy in Northern Kenya. The lodge has rooms that overlook several waterholes where you can get a chance to see animals like leopards, giraffes, elephants and zebras that gather to drink. 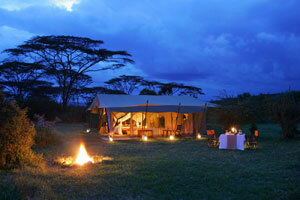 You will also have an opportunity to learn more about the Samburu people and their semi-nomadic way of life. Unique Features: The vastness and purity of this African landscape, combined with the untouched local culture, make your safari a unique experience. How to get there: Samburu airstrip – 1 hour drive from lodge. Private airstrip, near the Kalama Wildlife Conservancy headquarters. There are daily flights operated by Air Kenya from Nairobi to Samburu as well as from Meru. Safarilink also operates flights from Nairobi to Samburu. A Private charter from anywhere can be taken. Facilities: 2 cottages (1 double, 1 twin, 1 en suite bedroom, dressing room and private seating/dining area) and 2 family cottages. Laundry service, swimming pool and Samburu wellbeing space (massage and spa treatments). Drink Policy: Soft drinks, beer, house wines and non-luxury spirits are included in the room rates. Champagne, special wines and luxury spirits are additional. Activities: Day and night game drives, guided bush walks, ‘Warrior for a week’ programme, bush meals, sundowners, drawing safaris, rock climbing and cultural visits.